Taking aspirin can help in reducing the risk of colon cancer by 60 percent in people who have a history of disease. According to Tim Bishop, a researcher and the professor of epidemiology at Leeds University, the study they have conducted has proved another positive effect of aspirin and people who are at risk of colon cancer should seriously consider taking aspirin every day. For the study, the researchers from University of Leeds and Newcastle analysed about 1000 people from about 16 countries. All the people who were surveyed were suffering from Lynch syndrome which increases the risk of cancer in people. These people were divided into two groups – one group took two aspirins a day and the other group did not take aspirin. It was found that people who took aspirin for two years had reduced risk of cancer when compared to people who did not take aspirin. Also, women who took aspirin had reduced risk of womb cancer. However, the study does not say how aspirin helps in preventing cancer. Some scientists are of the view that aspirin causes the damaged DNA to die which reduces the risk of cancer. But people must be aware of the dosage they must take to reduce the risk of cancer. Increasing the dosage of aspirin can be dangerous as it can cause vascular bleeding and ulcers. 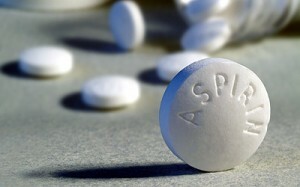 Some scientists are of the opinion that long-term use of aspirin can reduce the risk of cancer. However, most doctors avoid suggesting the use of aspirin for long-term use as it can cause serious stomach bleeding. People must not take even low doses of aspirin without consulting their doctor.